This entry was posted in Awards, SF & Fantasy Art, Worldcon and tagged Hugo Awards, Hugo base design, Misty Hawkins, Ray Bradbury, Vincent Villafranca, World Fantasy Award, World Fantasy Convention by Mike Glyer. Bookmark the permalink. I like it. The design, that is. The massive cluster behind it, not so much. I know very little about such matters, but I wonder how well that design will age. It seems easier for something more simplified or abstract, like the Hugo rocket, to over time become an iconic, timeless visual. rcade: Villafranca’s design is a variation on an extremely popular image — Google “tree of life” or “Halloween tree.” I expect it to be successful. I did wonder if the many other artworks with tree-with-sun-or-moon in branches would make the new WFA less distinctive, however, the commonality of rocket imagery hasn’t interfered with the iconic value of the Hugo rocket. Worldcon is run this way and they manage to pay base designers and Peter Weston (RIP) for the rockets. Ooooh, I like this design! I never understood why the award was a bust of Lovecraft. It’s called the World Fantasy Award, not the Lovecraft Award. Additionally, I would describe Lovecraft as a horror writer, not a fantasy writer, and I’m not swimming against the tide with that description. Sure, the lines are fuzzy, but of all the people who might feasibly represent the genre, he’s way, way down the list. Additionally, well, the bust was… let’s say, it was a style that appealed to a narrower range of visual tastes than you want an award to appeal to, IMO. I think that the new look for the award is an excellent choice. Very nice. I really like the wood grain reveal in the actual base of the award. I wonder what the award’s actual dimension’s and weight are? Yes I have always been convinced that Gahan Wilson must have been channeling Ralph Steadman at the time that he created the old H.P. Lovecraft bust for the WFC award. PhilRM: like Laura, I never understood why the WFA was a bust of Lovecraft anyway. Given that the first World Fantasy Convention and Awards were in 1975 in Providence, RI, and the programme theme was “The Lovecraft Circle”, it’s hardly surprising that’s what was chosen for the trophy. The creators of the con and the award were all huge Lovecraft fans. Given that famous cartoonist Gahan Wilson (Toastmaster for that con) was kind enough to go to all the work of designing the statuette for them for free, it’s understandable why it would never occur to a lot of Lovecraft fans that this might not be the most appropriate choice for a wide range of fantasy authors. I wonder if we’ll ever get to see Misty Hawkin’s runner-up design. I would love to have a look at that, because it was clearly wonderful as well, for the WFA to have made a point of commending her in that way. As a huge fan of Gahan Wilson in my childhood, I don’t think Wilson needed to channel anybody to create that bust. It was another one of his playful grotesques and would have been right at home with the inhabitants of his cartoons. @rcade: As a fan of both Lovecraft and Gahan Wilson – I still disliked that statue. It can symbolize all of fantasy (instead of horror), it’s pretty (instead of fugly and horrific), and it’s not racist. Win! As a fan of both Lovecraft and Gahan Wilson – I still disliked that statue. I like the statue because it’s a Wilson, but I don’t have a problem with it being replaced. 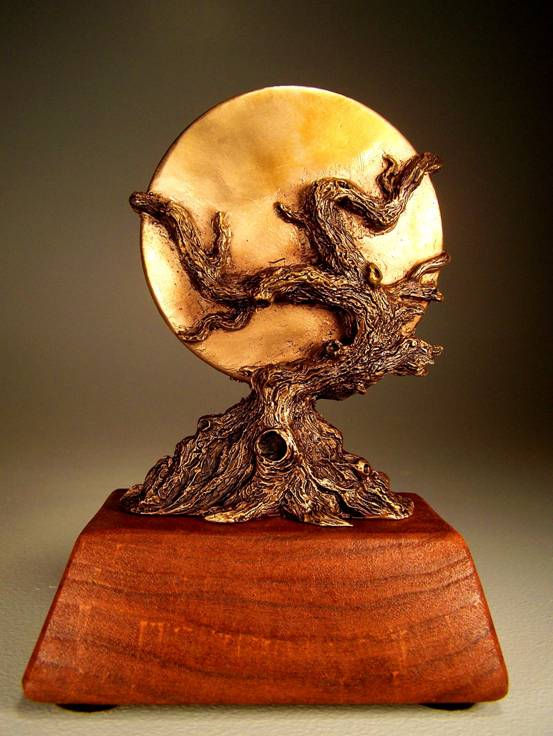 Writers who win the World Fantasy Award should be able to show off the trophy with unreserved pride. Well, I like it. It’s pretty, and a little spooky. Thanks! That post was put up after I first looked at her site. It would have been interesting to see it fully-created according to her specifications. Perhaps she will do a one-off. @ULTRAGOTHA: Worldcon is run this way and they manage to pay base designers and Peter Weston (RIP) for the rockets. This is … misleading … in several aspects. To start with, each Worldcon does its own design, which can be as cheap as it wants; WFC was looking for a worthy permanent design.The last Worldcon whose trophy information I was privy to paid for finished trophies; you can argue if you wish that part of that cost was the design, but design was not quoted separately — in fact, design proposals were expected to come with a quote for making a set. (IIUC, Villafranca will be doing the first sets of trophies, for which he will be paid.) Note that the Hugo base is supposed to be simple enough that it doesn’t eclipse the rocket, which would hold down the amount of design required. (Some Worldcons have had their own ideas about this.) Peter Weston hid the cost of the mold (per his article in the Noreascon 4 program book); IIUC, the next few WFCs are going to have to pony up for this in addition for paying for their trophies. The Villafranca is nice but feels a little generic. The Wilson is so much more evocative. I know which would have pride of place on my mantle. I wonder if it was production costs which knocked Wilson out of contention?